Peter Wilhelm "P.W." Dyck:, minister: born 30 November 1900 in Kronsfeld, Chortitza Mennonite Settlement, South Russia. He was the third of nine children of Wilhelm W. Dyck (17 October 1873 - 29 September 1941) and Sarah (Klassen) Dyck (26 July 1875 - 18 June 1954). On 8 June 1923 Peter married Helena "Lena" Epp (25 June 1902, Warwarowka, Yazykovo Colony, South Russia - 10 October 1947, Bassano, Alberta, Canada). She was the daughter of Johann Epp. Peter and Lena had five children: Helena, Sarah "Sadie," Peter, Irma, and Walter. After the death of his first wife, Peter married Agatha "Getty" (Schellenberg) Pries (28 November 1908, Schoeneberg, South Russia - 14 July 2001, Abbotsford, British Columbia (BC), Canada) on 22 July 1951 in Kelowna, BC. She was the daughter of Julius and Agatha Schellenberg and the widow of Henry G. Pries (1900-1945). She had three children from her first marriage, Hildi, Elsie and Rudy. Peter died 21 December 1988 in Chilliwack, BC, where he was buried on 30 December. After the anarchy of World War I, Peter took catechism and was baptized on his confession of faith on 8 June 1921 in Osterwick, Chortitza Colony. Three weeks after Peter's marriage to Lena in 1923, they and the Dyck family left Russia. They arrived in Rosthern, Saskatchewan on 21 August 1923 and worked in Laird, Saskatchewan. From there, the family moved to Harris, SK where they became part of a community of 24 partners that purchased the Wilson Farm. The family relocated to Saskatoon in 1928 where Peter found employment. In October 1930 the family moved to Rosemary, Alberta to join Peter's parents. Peter continued working in Saskatoon until the spring of 1931 when Peter began to farm in the area. 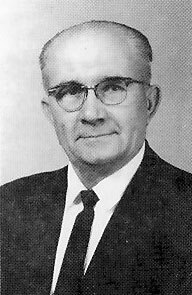 On 4 June 1933 Peter was elected as a minister of the Westheimer Mennonite Church (later Rosemary Mennonite Church) and was ordained to the ministry on 31 March 1935 by Elder Cornelius D. Harder. Acts 18:9,10, the text that Elder Harder used, helped and encouraged Peter many times in his ministry for the Lord. In 1947 his dear wife passed away. In 1951 Peter married Mrs. Agatha (nee Schellenberg) Pries from Kelowna, BC. In 1953 Peter and his wife "Getty" moved to Calgary where he assisted as a minister in the Scarborough Mennonite Church (later First Mennonite Church Calgary). After a short time in Etzicom, Alberta, Peter and his family moved to Chilliwack, BC. Peter was asked to become the pastor of the Yarrow United Mennonite Church after John Julius Klassen resigned in 1958. On 21 June 1959 he was ordained as elder of the same church by Elder Jacob B. Wiens. He worked tirelessly until his retirement as leading minister on 1 January 1970. The Yarrow people loved, helped, and encouraged P. W. and Getty. Peter and Getty moved from Yarrow to Chilliwack in 1976, and he continued serving as elder until 1977. Later P. W. lost his eyesight and suffered from diabetes. However, he retained his optimism, his sense of humor, and his very strong faith in his Savior and Lord. Peter's aim in life was to serve the Lord faithfully, to preach the Word tirelessly, and to love God, his family and his congregation with all his heart and strength. Der Bote (1 February 1989): 6; (19 September 2001): 22. Dyck, Peter W. My Path of Life. Translated and edited by A. B. Koop. N.l. : n.p., . Printed by Kask Graphics, Campbell River, BC. Janzen, Sarah. "Dyck, Peter Wilhelm "P. W." (1900-1988)." Global Anabaptist Mennonite Encyclopedia Online. October 2005. Web. 21 Apr 2019. http://gameo.org/index.php?title=Dyck,_Peter_Wilhelm_%22P._W.%22_(1900-1988)&oldid=132777. Janzen, Sarah. (October 2005). Dyck, Peter Wilhelm "P. W." (1900-1988). Global Anabaptist Mennonite Encyclopedia Online. Retrieved 21 April 2019, from http://gameo.org/index.php?title=Dyck,_Peter_Wilhelm_%22P._W.%22_(1900-1988)&oldid=132777. This page was last modified on 22 November 2015, at 03:03.